One day we stopped by to see Joe- our farmer friend down the road. We wandered the farm looking at the last of his bounty for the season. It was a glorious day that I enjoyed so much. Before we left with our bushel of apples we bought from him, he handed me a few handfuls of fresh concord grapes he picked the day before. The smell was absolutely HEAVENLY & the taste was even better. We could have very easily eaten them all while we drove around that day & that would have been it for those grapes. But I held everyone off & saved them until we got home. I wanted to make something with them that would allow us to enjoy those fresh concord grapes for many days. Just look at how gorgeous these ones are. I went a little photo happy while I was there. He picked these off later that day. OH! MY! GOSH! This tastes amazing. I’m having a hard time not eating it right out of the jar. Place 2 spoons in the freezer to chill. Bring pot to a boil & keep boiling about 40-45 minutes - keep stirring through this time. You will see the grapes break down, the seeds floating around & the mixture thickening up. Once you reach the 40 minute mark take one of your spoons from the freezer & dip it in your spread- return to the freezer for 3 minutes. Continue to boil mixture while you are waiting for the spoon. Remove spoon & tip to see if it runs- if it doesn't- your spread is ready. If it does run- continue to boil additional 5 minutes at a time & repeat the spoon test until it doesn't run. Once it's ready - remove from heat. Place a mesh colander over a small bowl & pour your spread in carefully. Press through with your spatula to get as much of the spread into your bowl while straining those seeds & remaining skins out. 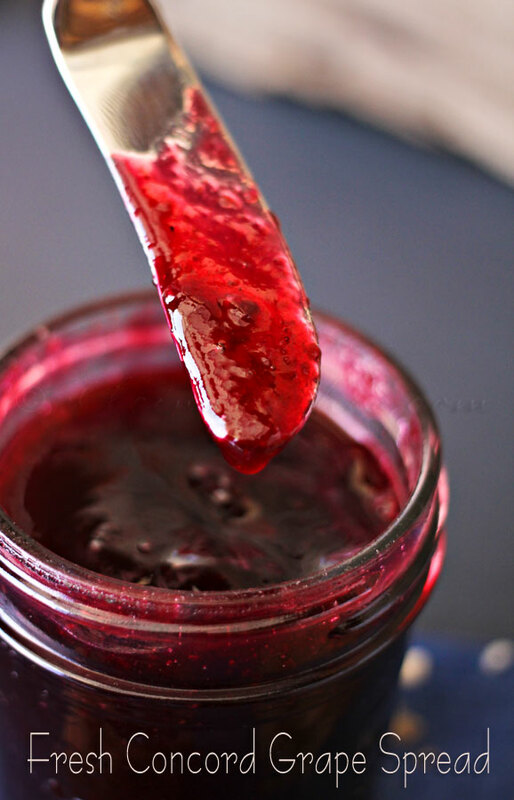 Once you have strained completely- toss the seeds & skins & transfer your spread to your jars. Allow to cool overnight before using. Store in refrigerator or in freezer for long term. 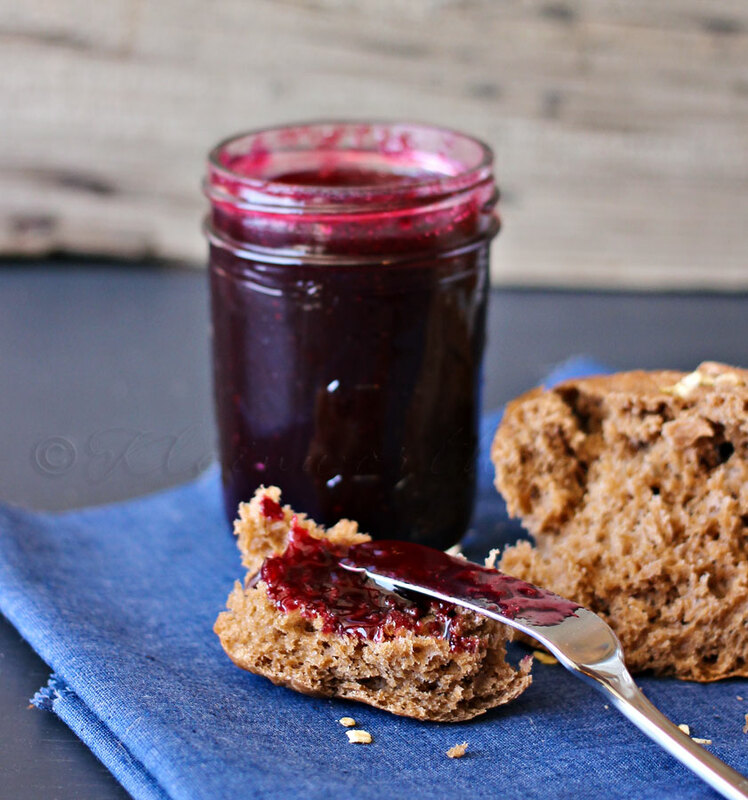 You will LOVE having this on your morning toast or muffin. Thanks for sharing! This looks absolutely delish & I will have to give it a try sometime. Thanks for the recipe. I’ve been feeding my Concord grapes to my chickens who go crazy for them. So I’m happy to have a recipe to try especially for a small amount of grapes. I have 2 grape vines so it’s not like I get a ton of grapes. How wonderful! They look amazing and I’m glad you showed some self control to make that yummy looking jam! 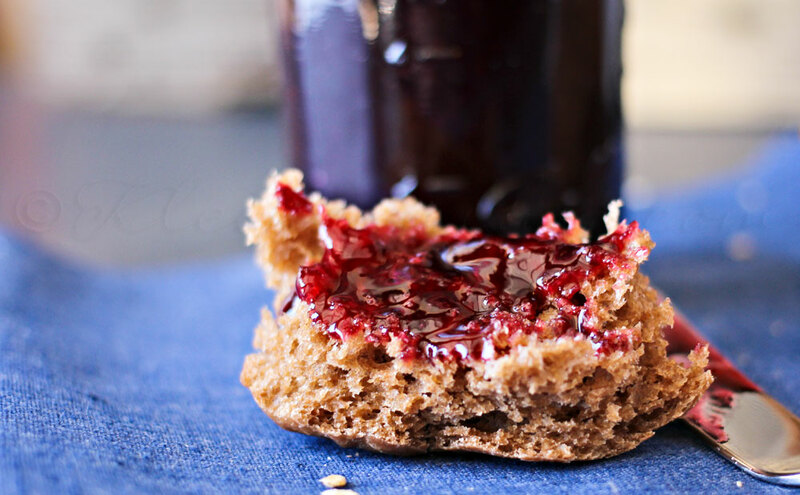 I have never been a grape jam/jelly person – but whoa this looks good! 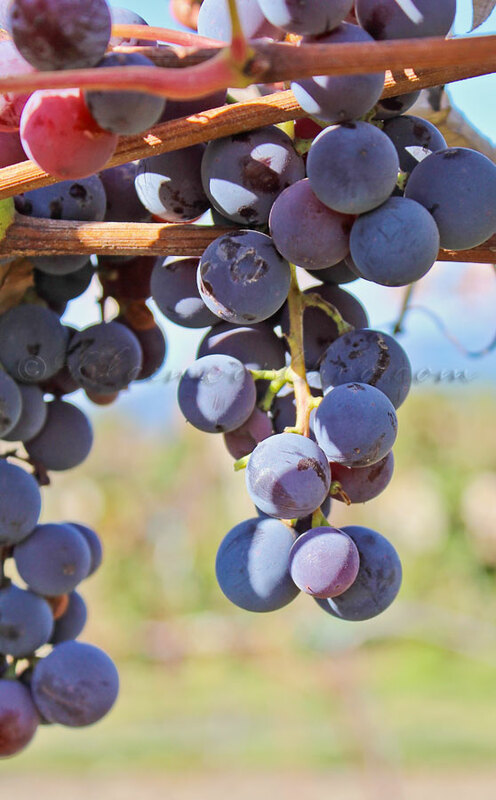 yum … my mouth is watering … beautiful grapes and thanks for the recipe! Yum! What a great venture! We have lots of concord grapes. I usually steam them and make juice. I’ll have to try this jelly recipe next year. The spoon trick is an interesting one. 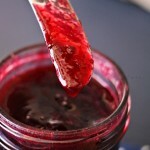 Okay I don’t normally like grape jelly (I’m a berry jam kind of girl) but this looks so delicious. Thanks for sharing on the weekend re-Treat link party. I’m stopping by from the TGIF linky party! This looks fabulous – and only three ingredients. I love it! Hi! Stopping by from the TGIF Link party! This looks so yummy! Thank you for sharing. My grandma used to make spread like this, but she put crushed walnuts in it, which sounds weird but was DELICIOUS! Thanks for sharing at the Pinworthy Project Party! That sounds great- I will have to try that.